Corinne Hermes won the 1983 Eurovision Song Contest with 'Si la vie est cadeau'. 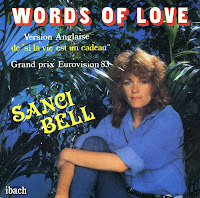 That same year, the singer Sanci Bell recorded an English version of that song entitled 'Words of love'. It's hard to find any information on Sanci Bell, she didn't release much more than this one single, I have to assume.